In addition to the start of Q3 earnings season, markets will have to contend with a number of notable events this week. Inflation releases in the US and Europe, the result of Brazil's first round presidential election, the IMF and World Bank annual meetings, a meeting between US Secretary of State Pence and North Korea's Kim Jong Un should provide plenty of food for thought. Europe's two most pressing policy flashpoints, Italian budgetary policy and Brexit, will be firmly in focus as the Italian Parliament debates the budget plan and a European Commission meeting lays out the future EU-UK relationship. Foreign trade data from China, Taiwan and Germany are expected to point to only a slight loss of momentum, but the damage from escalating tariffs is likely to show up in time. In the US, an uptick in core inflation will weigh more heavily than a slump in the headline rate and keep the Fed on the tightening path. As DB notes, with it being a post-payrolls week next week there's the usual lull we get after that report for the first few days however once we hit midweek we've got a couple of inflation reports to look forward to in the US. On Wednesday we'll get the September PPI report and then on Thursday we'll get September CPI. Given the move in rates last week there should be plenty of focus on these data points. For CPI, as always the consensus is for a +0.2% mom core reading (the 36th month in a row) which should be enough to push the annual reading up a tenth to +2.3% yoy and therefore keeping the reasonable headroom over the Fed's target. Those releases are the highlights in the US. The only other prints due are the September NFIB small business optimism reading on Tuesday, August wholesale inventories on Wednesday, September monthly budget statement on Thursday and September import price index and October University of Michigan consumer sentiment readings on Friday. Here in Europe we'll also get some inflation data with the final September revisions due in France and Spain on Thursday and then Germany on Friday. We'll also get some important hard data releases with August industrial production due in France and the UK on Wednesday and the euro area on Friday. In Asia we'll get the remaining Caixin PMIs in China on Monday and then September trade data on Friday. Meanwhile, it's set to be another busy week for Fed speakers next week. St Louis Fed President Bullard is due to speak in Singapore on Monday. New York Fed President Williams and Philadelphia Fed President Harker are due to speak at separate events on Tuesday. Williams, along with Chicago Fed President Evans and Atlanta Fed President Bostic are due to speak on Wednesday with the latter two on the subject of the economic outlook. Finally Evans and Bostic will then speak again on Friday. Over at the ECB the scheduled speakers include Villeroy de Galhau on Tuesday and Lautenschlaeger on Friday. The ECB minutes from the September meeting are also due to be out on Thursday. Elsewhere, some of the focus will turn back to earnings with Q3 reports due from JP Morgan, Citi and Wells Fargo on Friday. Prior to that we'll also get earnings reports from Walgreens Boots and Delta Airlines on Thursday. The big test for EM next week may well come over this weekend when we get the first round presidential elections on Sunday in Brazil. According to Bloomberg, recent polls have showed that support for right-wing lawmaker Bolsonaro is on the rise versus the left-wing Workers' Party candidate Haddad, however it remains extremely tight and that's especially the case for the second round where support is closer to a coin flip. Brazilian assets have gained over the last week as support for Bolsonaro has gained. Other potentially interesting events to be aware of next week include US Secretary of State Pompeo meeting with North Korea's Kim Jong Un this Sunday in Pyongyang as preparation for a possible second Trump-Kim summit. On Monday Italy's Deputy Premier Salvini will speak at a conference with France's Le Pen while German Chancellor Merkel is also due to hold a town hall in Germany on the future of Europe. On Tuesday the annual meetings of the IMF and World Bank kick off (through to October 14th) with the World Economic Outlook due to be released that day. On Wednesday the focus should turn back to Brexit with permanent representatives to the EU discussing Article 50 and the UK exit plan, and EU Chief Negotiator Barnier due to present the draft political declaration. Finally on Friday it's worth keeping an eye on events in Turkey with American pastor Brunson due to appear for a court hearing, which could possibly lead to his release in the near future. Monday: It's a relatively quiet start for data releases on Monday. In China we'll get the September Caixin services and composite PMIs, while in Europe August industrial production in Germany, the September Bank of France business sentiment survey and October Sentix investor confidence reading for the euro area are all due. 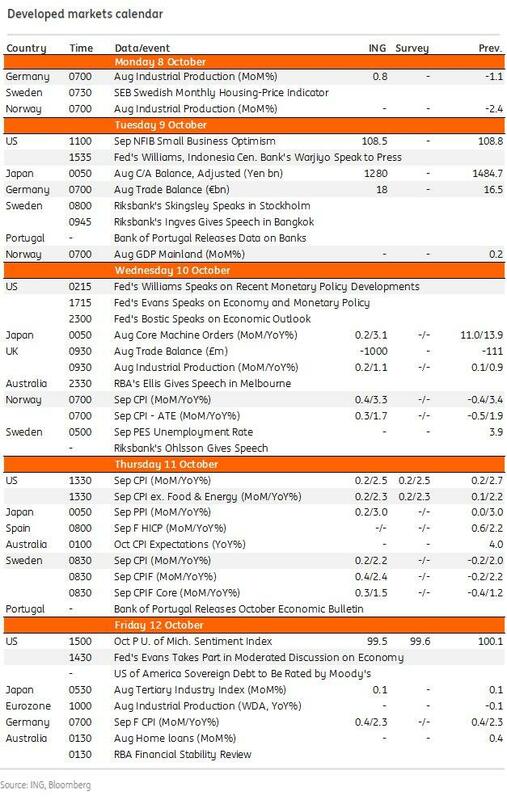 There's no data due in the US however the Fed's Bullard is scheduled to make comments. Meanwhile Italy's Deputy PM Salvini and France's Le Pen are due to take part in a conference, while Italy's Parliamentary Budget Office Head Pisuaro is due to speak. German Chancellor Merkel is also due to make comments on the future of Europe at a town hall. It's worth also noting that markets in Japan are closed on Monday while Columbus Day in the US may mean slightly thinner trading volumes than usual in the afternoon. Tuesday: Overnight on Tuesday we'll get the August trade balance in Japan before we get August trade data released in Germany. The only print due in the US is the September NFIB small business optimism reading. Away from that we're due to hear from the ECB's de Galhau and Fed's Williams and Harker. The annual meetings of the IMF and World Bank will also kick off, continuing to October 14th . Wednesday: There's no overnight data scheduled to be released on Wednesday however we are due to hear from the Fed's Williams early in the morning. In Europe the highlights should be August industrial production prints in France and the UK along with the August monthly GDP reading in the latter and latest trade balance reading. In the US the main focus should be the September PPI report, while August wholesale inventories data is also due. Outside of that we'll also hear from the Fed's Evans and Bostic. Brexit should also remain a focus with permanent representatives to the EU discussing Article 50 and the UK exit plan and EU Chief Negotiator Barnier due to present the draft political declaration. Thursday: The big data highlight on Thursday comes in the afternoon when we'll get the September CPI report in the US. Prior to that we'll also get final September CPI revisions in France and Spain, while also out in the US is the latest weekly initial jobless claims print and September monthly budget statement. The BoE's latest credit conditions and bank liabilities survey will also be out, along with the ECB minutes of the September 12-13 meeting. Friday: Closing out the week on Friday will be the final September CPI revisions in Germany along with August industrial production data for the euro area. In the US the September import price index reading and the preliminary October University of Michigan consumer sentiment survey will be out. September trade data in China should also be out at some stage, while the Fed's Evans and Bostic are due to speak. JP Morgan, Wells Fargo and Citi will release Q3 earnings. Finally, looking at just the US, Goldman notes that the key economic release this week is the CPI report on Thursday. There are several scheduled speaking engagements by Fed officials this week, including speeches by New York Fed President Williams and Vice Chairman for Supervision Quarles. 05:30 AM St. Louis Fed President Bullard (FOMC non-voter) speaks: St. Louis Fed President James Bullard will speak at the Lee Kuan Yew School of Public Policy in Singapore. Media Q&A is expected. 08:00 AM Dallas Fed President Kaplan (FOMC non-voter) speaks: Dallas Fed President Robert Kaplan will speak at the Economic Club of New York. Audience and media Q&A is expected. 01:00 PM Philadelphia Fed President Harker (FOMC non-voter) speaks: Philadelphia Fed President Patrick Harker will give a speech on “The Importance of Higher Education to the U.S. Economy” at a conference in Philadelphia. Audience Q&A is expected. 09:10 PM New York Fed President Williams (FOMC voter) speaks: New York Fed President John Williams will discuss recent developments in U.S. monetary policy at a New York Fed-Bank Indonesia Central Banking Forum in Bali, Indonesia. Audience Q&A is expected. 10:30 PM New York Fed President Williams (FOMC voter) speaks: New York Fed President John Williams and Bank Indonesia Governor Perry Warjiyo will hold a joint press conference at a New York Fed-Bank Indonesia Central Banking Forum in Bali. 08:30 AM PPI final demand, September (GS +0.2%, consensus +0.2%, last -0.1%); PPI ex-food and energy, September (GS +0.2%, consensus +0.2%, last -0.1%); PPI ex-food, energy, and trade, September (GS +0.2%, consensus 0.2%, last +0.1%): We estimate a 0.2% increase in headline PPI in September, reflecting relatively firmer core prices, weaker food prices, but higher energy prices. We expect a 0.2% increase in both core measures of PPI, reflecting a continuation of the average recent trend in producer prices. 12:15 PM Chicago Fed President Evans (FOMC non-voter) speaks: Chicago Fed President Charles Evans will speak on the economy and monetary policy at an event in Flint, Michigan. Media and audience Q&A is expected. 06:00 PM Atlanta Fed President Bostic (FOMC voter) speaks: Atlanta Fed President Raphael Bostic will discuss the economic outlook at a National Association of Corporate Directors event in Atlanta. Audience Q&A is expected. 08:30 AM CPI (mom), September (GS +0.19%, consensus +0.2%, last +0.22%); Core CPI (mom), September (GS +0.25%, consensus +0.2%, last +0.08%); CPI (yoy), September (GS +2.42%, consensus +2.4%, last +2.68%); Core CPI (yoy), September (GS +2.32%, consensus +2.3%, last +2.19%): We estimate a 0.25% increase in September core CPI (mom sa), which would round up to three tenths and move the year-over-year rate up to +2.3%. Our forecast reflects a rebound in apparel prices, which have declined for three consecutive months despite lean inventories and now look depressed relative to import prices. Though imposed late in the month, we believe tariffs on $200bn of Chinese goods could add around 1 basis point to month-over-month core inflation in September (and may manifest in the household furnishings category). We estimate a three tenths monthly rise in the shelter measures; while alternative rent growth measures have slowed, vacancy rates remain low and imputed utility costs should support the owners' equivalent rent category. We also expect a boost from higher airfares and used car prices. On the negative side, we expect another decline in medical care commodities prices, reflecting continued prescription-drug price freezes. We look for a 0.19% increase in headline CPI (mom sa), reflecting a slight drag from energy prices. 08:30 AM Initial jobless claims, week ended October 6 (GS 205k, consensus 210k, last 207k); Continuing jobless claims, week ended September 29 (last 1,650k): We estimate initial jobless claims declined by 2k to 205k in the week ended October 6, following a 7k decline the previous week. Jobless claims fell last week by 6k in North Carolina, following a 10k rise the prior week after Hurricane Florence, and we expect the effects to continue to moderate. 08:30 AM Import price index, September (consensus 0.2%, last -0.6%); 09:30 AM Chicago Fed President Evans (FOMC non-voter) speaks: Chicago Fed President Charles Evans will take part in a moderated discussion at the ENGAGE Undergraduate Investment Conference in Ann Arbor, Michigan. Media and audience Q&A is expected. 10:00 AM University of Michigan consumer sentiment, October preliminary (GS 100.9, consensus 100.6, last 100.1): We estimate the University of Michigan consumer sentiment index edged up 0.8pt in the preliminary estimate for October, reflecting continued strength in recent high-frequency consumer surveys. The report’s measure of 5- to 10-year inflation expectations stood at 2.5% in September. 12:30 PM Atlanta Fed President Bostic (FOMC voter) speaks: Atlanta Fed President Raphael Bostic will discuss recruitment, economics and the public policy profession at a conference in Atlanta. Audience Q&A is expected. 10:00 AM Vice Chairman for Supervision Quarles (FOMC voter) speaks: Fed Vice Chairman for Supervision Randal Quarles will speak at an Institute of International Finance event at the annual IMF meeting in Bali, Indonesia. Audience Q&A is expected.